The tool is called the “tooth” of the machine. Tool is a tool used in machining, also called cutting tool. Most tools are used by machines, but also by hand. 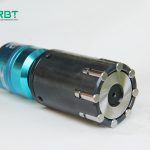 As the cutting tools used in mechanical manufacturing are generally used to cut metal materials, “cutting tools” are generally understood as metal cutting tools. The tool is consumable, so it should be used and maintained carefully. In this way can we extend the life of the tool and make it more economical. Today, RBT shares a few tips for how to use and maintain the rotary broach. When a new rotary broach is about to be used, the anti-rust oil on the rotary broach must be cleaned and the teeth of the broach must be sharp. If we find that the rotary broach has a gap or a broken edge, we can grind away the convex point of the oilstone or make swarfs at the convex point. The movement direction of the oilstone should be consistent with the movement direction when it works (i.e. the oilstone moves towards the handle of the rotary broach). 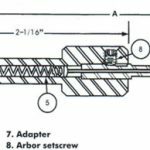 When pulling the inner surface, the length of the rotary broach shall not exceed the range specified by the rotary broach, otherwise the broach will break the edge or break; However, the length of broaching should not be too short. The number of working teeth should not be less than 3 when broaching, so as to make the broaching process smooth. Before broaching, the brochure holder should be adjusted to the same center as the workpiece hole. When the gap between the workpiece hole and the leading part of the broach is large, the workpiece should be moved to the broach teeth with the same diameter as the hole before starting the broaching. Otherwise, the hole deviation and the danger of broach fracture will be caused. 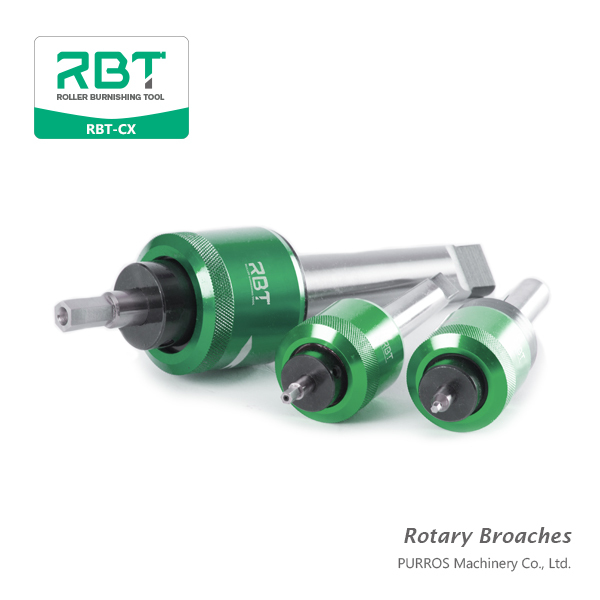 Before broaching, rotary broach should be rinsed or soaked with cutting fluid to remove debris or other dirt attached to the cutter teeth. During broaching, the cutting fluid should be sprayed strongly on the cutter teeth and cooled sufficiently on the surface of the workpiece. When the surface roughness of the workpiece is high, it is recommended to using emulsified liquid with high concentration (about 20%~25% emulsified liquid ointment, the rest part is water). For long and heavy broach, self centering steady rest with a thimble should be used to hold the rotary broach from the beginning of broaching to about half of the work. The pinhole at the top of the calibrated tooth moves along with the broach to eliminate the phenomenon of the rotary broached wagging tail and avoid bending or breaking with rotary broach. When the broach is lighter, the self centering steady rest is not used generally. We can also reduce wagging by holding the end of the rotary broach in our hands. When the calibration teeth of the tool are started to work, the workpiece may fall due to its own weight. The heavier the workpiece, the more serious the falling. This will cause the broach to bend. When the workpiece is light, we can hold it by hand. Alternatively, a supporting iron should be placed under the workpiece in advance, or the workpiece should be pressed on the stretcher baffle with the press plate to prevent the workpiece from falling down. During broaching, the surface quality of workpiece broaching and the wear of broaching should be observed frequently. The mill should be repaired in time according to the situation. After broaching a workpiece, the swarf attached to the tool teeth should be brushed away with a copper wire brush. It is strictly prohibited to use to wire brush, or cotton yarn wipe, so that cotton fiber hooks to the teeth of the tool, and will also cut the hand. When it is difficult to remove the swarfs from the teeth with a copper brush, but it can be gently wiped off with an oilstone. When the rotary broach is used, it should be suspended vertically to prevent the teeth of the rotary broach from touching metal objects (including other rotary broach objects).